Filmed 29th August 1999, this 7 minute short film was shown at the Space: 1999 Breakaway Convention in Los Angeles on September 13th, 1999. The original licensing deal from Carlton did not allow it to be shown in public -or private- again. However, in 2002 it was released to DVD in France. A picture emerges from static: it is Sandra Benes, speaking to camera. "This is Moonbase Alpha with our last transmission to the people of Earth." 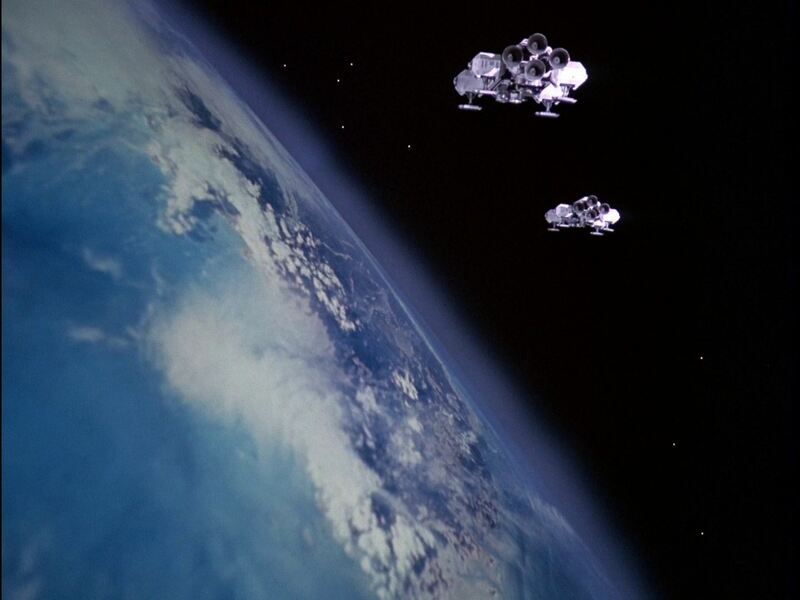 It is 20 years since they lost contact with Earth. The Moonbase life support systems are slowly failing. They are in range of a habitable planet, named Terra Alpha, for 6 days, insufficient for a thorough survey. It has been decided to abandon Alpha for the planet. Sandra is the last to leave the base. A slingshot effect may return the Moon to the planet in 25 years. Computer will encode Sandra's message using a device designed by Maya, to enable it to navigate time and space to reach Earth. Sandra signs off, her voice heavy with emotion: "Remember us." The signal we see in the final shot is the Meta signal. The set was built from replica Year 1 panels and an original Command Centre desk. Stock effects from other episodes was used: see list. Note the use of unused SFX footage from The Last Enemy and the Year 2 titles. 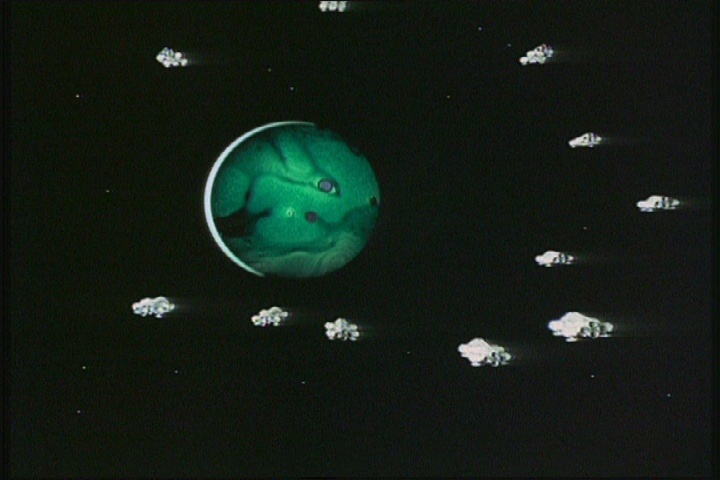 Footage of Ariel from The Last Sunset and Retha from Full Circle were coloured green to represent Terra Alpha. There are two versions: one version has no music (on the TF1 disc), the other has Barry Gray's closing theme and incidental tracks (on the A&E bonus disc). 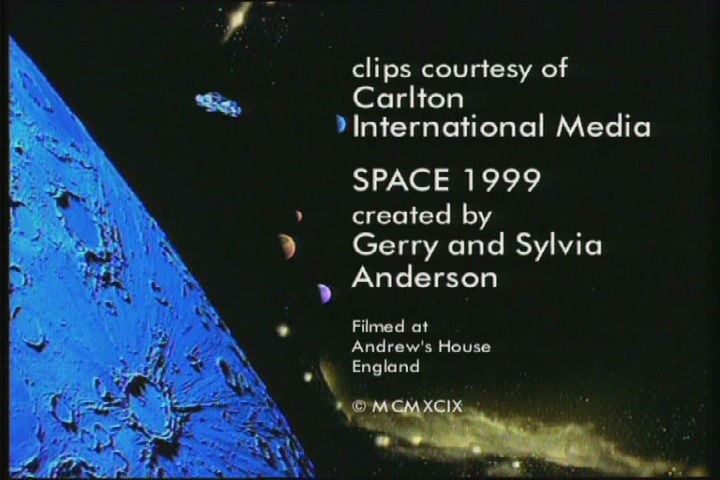 The license to use Gray's music is separate from Carlton's license to Space 1999, and the difficulties in negotiating the separate music license gave rise to the two versions. The moon has a slingshot trajectory. These trajectories are used to accelerate space probes, using the gravity of a planet. Hence the Cassini probe flew first to Venus, then again past Earth, to accelerate it to reach Saturn. The slingshot here may involve Terra Alpha, other planets in the solar system, Terra Nova's sun or nearby stars. Unfortunately it may be travelling too fast for the Alphans to catch it in 25 years time. "We calculate it is twenty years since we lost contact with you." This may be counting from Breakaway (1999, so the date is 2019), or after Journey to Where (set around 2001/2002, although no specific date is given, so the current date is 2021/2022). But why "we calculate"? Sandra could be calculating Earth's date (20 years after 2120, so the date is 2140) and the "days since Earth orbit" is another number entirely. The Meta signal received in 1999 (in Breakaway) is the same as the signal that Maya (the Metamorph) sent through time and space- Sandra and the Alphans do not realise this (according to writer Johnny Byrne). We know Koenig (said to be on the planet) and Sandra (recording the message) are still alive. Maya is mentioned but we do not know if she or any other characters (Helena, Tony, Alan) are still alive. Sandra mentions the loss of Michael (Ryan from Black Sun), Anna and Luke (from Testament of Arkadia), and Paul and Professor Bergman (note, they may not necessarily be dead). 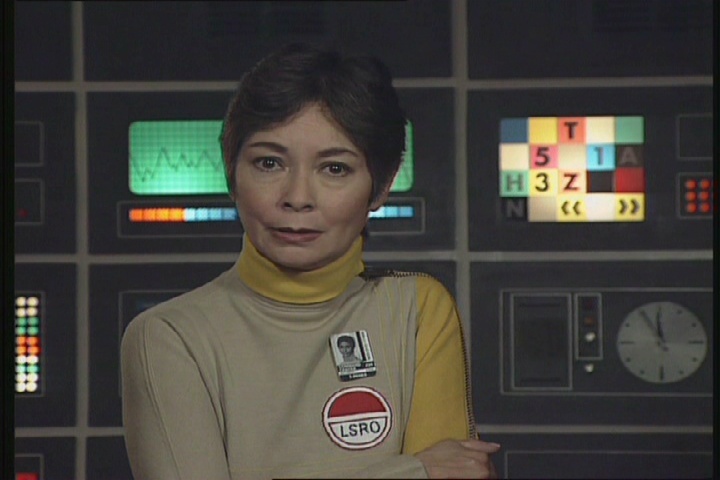 Sandra wears a Year 2 uniform and stands behind Koenig's Year 2 desk (the location according to the test card is Technical Section). The computer panels beyond are Year 1 panels. 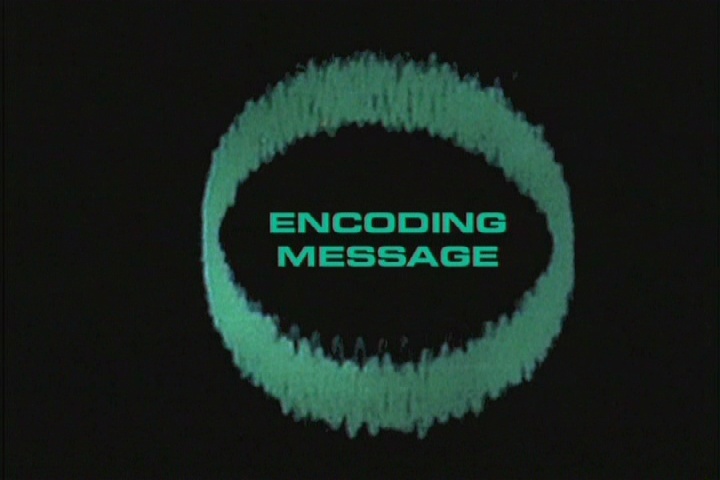 The message is sent through time and space by an encoding device designed by Maya. The metamorphised signal is detected by Earth in 1999 as the Meta signal from Breakaway. Alpha's life support system is fragile again. "For some time, our life support systems have shown signs of increasing decay. Total failure, though not imminent, seems inevitable." Although the script doesn't specify as such, according to Johnny Byrne the base is stripped of all available resources for the Exodus (as it was in Another Time, Another Place). 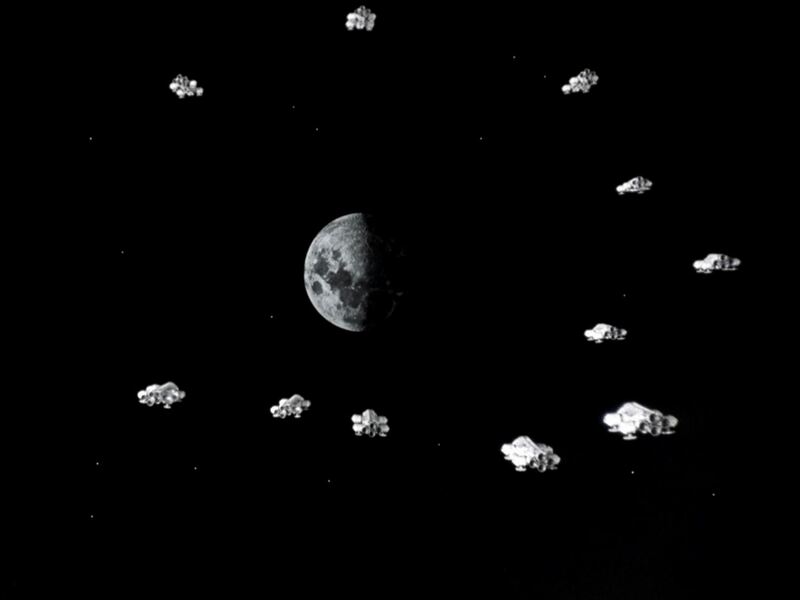 Moon under gravity effect - stock shot from year two opening titles. Solar System - unused shot from The Last Enemy. Eagles flying to planet - composite shot, Guardian Of Piri - Eagles fly back to moon + planet Ariel (The Last Sunset, coloured green). Eagles in orbit - Eagles and planet from Full Circle (coloured green). Eagle on launch pad - stock shot, Black Sun. Generating area - Force Of Life. Dark command centre - AB Chrysalis. Paul and Sandra kiss in spacesuits - The Last Sunset. Helena and baby - Alpha Child. Alphans in the rain - The Last Sunset. John's gift for Helena - Dragon's Domain. Victor and John's toast - Black Sun. Alan and John try to keep Helena warm - Journey To Where. Maya in tears, looks up - The Metamorph. Maya and Tony playful after sampling beer - Journey To Where. Alan and Etrec -Mark Of Archanon. 3 Aliens in mist - AB Chrysalis. Sahn kisses Peter -Bringers Of Wonder (part one). John and Helena explore the planet - New Adam, New Eve. Meta signal loop - Breakaway. How is the Meta signal associated with the planet Meta? Is the signal coming from the same location in space (coincidentally), or has it latched onto the planet? Or is the planet Meta an illusion or metamorphic creation? The short film brings the journey of the Alphans to a close as they settle on the planet Terra Alpha. It strongly recalls the concept and mood of Victor Bergman's farewell to Alpha in War Games. "It was Maya, the Psychon, who helped us to understand that we are all aliens until we get to know each other." See Koenig's line to Maya in The Metamorph: "We're all aliens. Until we get to know one another." "And to state our belief, though our moon's progress was random, our odyssey does have a purpose, one still in the act of revealing itself..." Compare to Koenig's narration in Testament Of Arkadia "We must keep faith and believe that for us, for all of mankind, there is a purpose." and Arra in Collision Course "You and I are two vital drops in the boundless oceans of time. We met with purpose. We must not fail our destiny." The decision to abandon the base was "greatly... disputed". There is conflict between the Alphans and more democratic processes than we have seen before (where Koenig made autocratic decisions). Was Sandra on the opposing side? Sandra says of the empty base: "And to Alpha, wherever you go on your onward journey, our hearts go with you, and hope of reunion in the future will never fade..."
Arra in Collision Course predicted "Your odyssey shall know no end. You will prosper and increase in new worlds, new galaxies. You will populate the deepest reaches of space." Although the film seems to indicate the end (they settle a planet and no longer explore space), some survivors could return to the Moon in 25 years when it returns. The colonies on Terra Alpha and Arkadia (from Testament of Arkadia) would start to fulfil the prophecy that they "prosper and increase in new worlds". 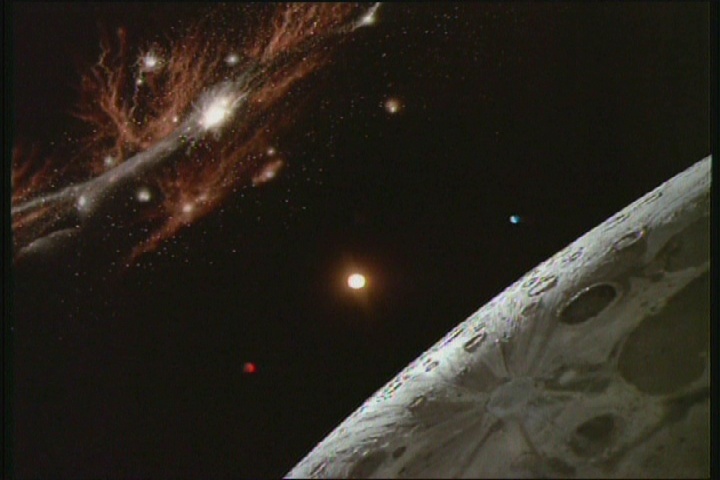 The plot establishes new directions for a new series of Space: 1999, which were proposed to Carlton and other backers. As the film says, in 25 years the Moon will return to this planet. Johnny Byrne notes conditions are difficult for the Alphans on the new planet- much like the scenes in the unfilmed script Face Of Eden (which eventually turned into Immunity Syndrome). 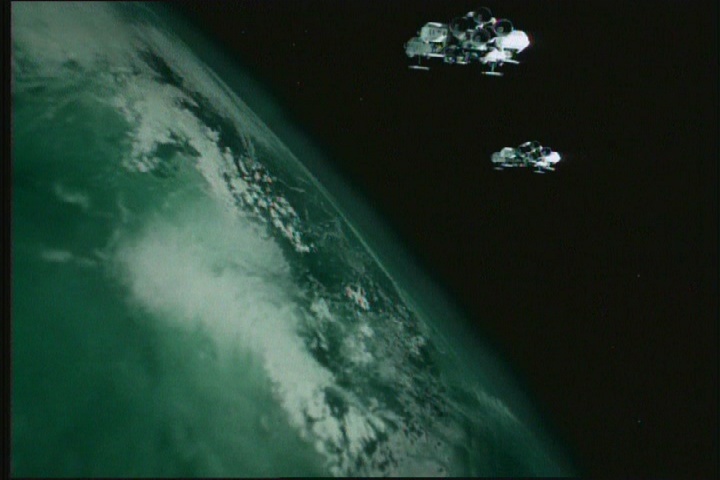 The survivors will be split; some will return to the Moonbase while others, led by Koenig, will remain on the planet (Koenig will not leave the grave of Helena). The new series would follow the adventures of the new Alphans returning to the Moon, with a new generation of characters as well as some returning from the original series. The series may start with a movie-length or multi-part story establishing which Alphans stay on the planet and which return to the base. 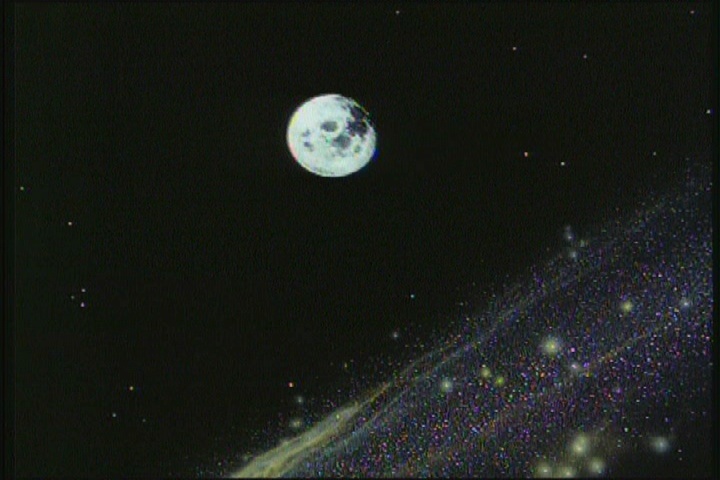 The remainder of the series would, like the original series, feature the Moon travelling through space encountering alien planets and civilisations. This scenario allows some of the original cast to return or be written out depending on their availability. For instance, with Martin Landau's age and movie career he is not likely to want to return to head a TV series (although it is hoped he might be in the initial story). Neither is Barbara Bain likely to return (having Helena die does give Koenig a powerful motivation in the initial story, however). Catherine Schell has retired from acting, so Johnny Byrne speculated the new series might feature a child of Maya and Tony. The original cast would be portraying characters much older than themselves: if Koenig was 40 in 1999, he would be 60 at the time of this film and 85 at the start of the new story. 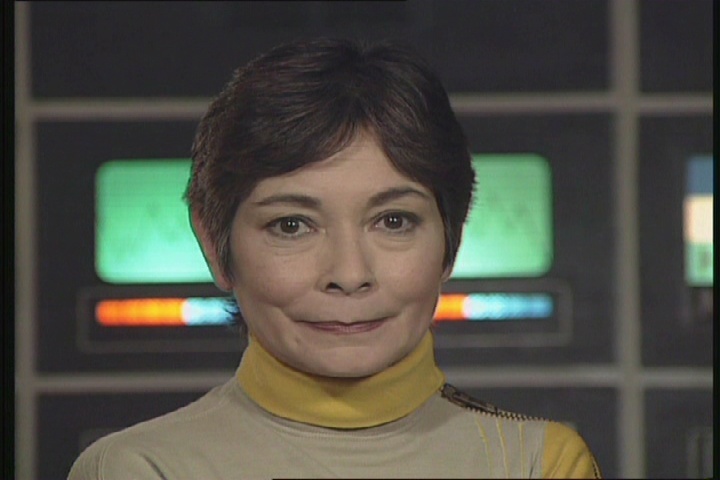 Sandra was 30 in the original series; 50 at the time of this film and 75 at the start of the proposed series. 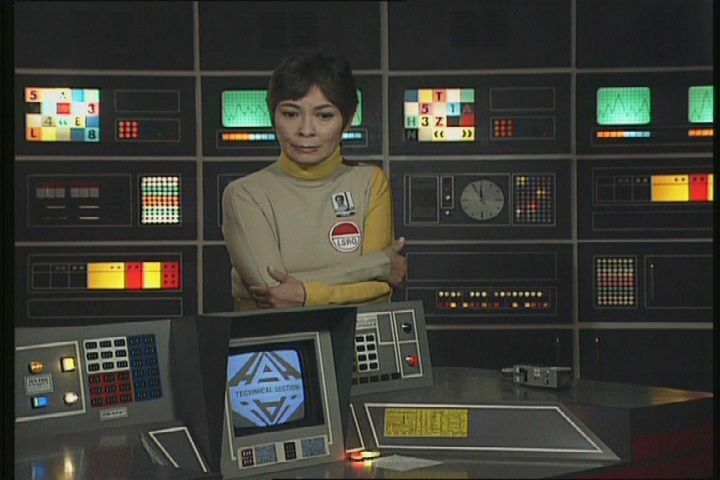 The technology and sets could be updated as the original Moonbase was gutted of most facilities and must be rebuilt with equipment from Terra Alpha. 2014: There is a proposal for a sequel series called Moonbase Alpha Legacy , set when the Moon returns to Terra Alpha, 40 years after the events of Message From Moonbase Alpha. An Italian dub was created for the Italian Pulp Video release.